Regional players hold a considerable share in the global animal feed additives market for ruminants. The market is largely fragmented, however, holding over 48.5% of the overall share, BASF, DSM, Elanco, and Danisco emerged dominant in 2014. Of these, DSM currently has a stronghold in the global animal feed additives market for ruminants. Besides this, BASF has emerged as a key market players on the back of its diverse product portfolio. Among the key types available in the global animal feed additives market for ruminants, feed enzymes, minerals, amino acids, and vitamins are the most commonly produced variants by the aforementioned players. As per TMR, DSM is a leading provider of feed enzymes, minerals, and vitamin animal feed additives in the world. Top tier enterprises and regional players alike investing in the development of various coating technologies intended to enhance effectiveness of animal feed. Such investment towards improving product quality is likely to spur the sales of animal feed additives over a period. As a resulting effect of the aforementioned factors, the global animal feed additives market for ruminants will report a steady growth between 2015 and 2021. At this pace, the market will reach US$5.9 bn by the end of 2021 as compared to US$4.7 in 2016. Among various products available in the market, vitamins and amino acids held leading share in the market. The vitamins and amino acids segments will continue leading the market and is projected to 15.64% and 20.39%, respectively by the end of forecast period. 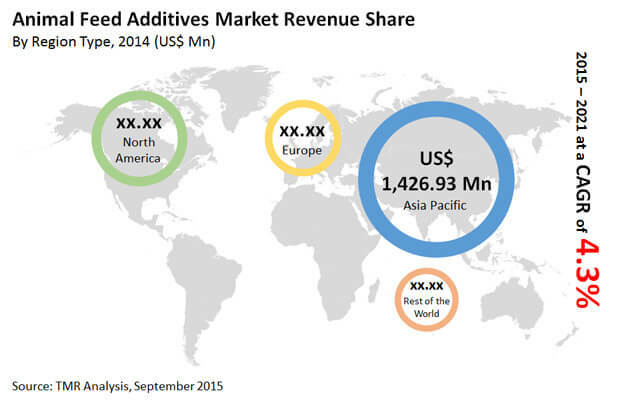 Regionally, Asia Pacific is forecast to hold the maximum share in the global animal feed additives market. The rising demand for foods derived from animal is likely to boost the global animal feed additives for ruminants market. As a result of spurring consumption of meat and dairy products, the animal husbandry industry is under pressure to increase their yields. As a result they are compelled to maintain healthy cattle and increase their count. This will in turn tip scales in favor of the global animal feed additives market for ruminants. A key point to consider here that the demand for dairy products is surging at an exponential pace around the world, followed by the demand for meat. Due to recent health concerns, both these types of products are subjected to stringent quality checks and intense safety queries. Because animal feed can go a long way maintaining health of animals and cattle, their demand is on a rise. Animal feed additives are often used to improve immunity in cattle and prevent them from falling ill. According to TMR, the demand for animal meat and dairy is likely to accelerate considerably in Asia Pacific. The rising population in emerging nations, besides increasing disposable income of consumers will fuel the demand for dairy and meat products. This, coupled with the increasing health concerns among consumers, will increase the use of animal feed additives for ruminants. In addition to this, the rising demand for cattle-based meat in North America will boost growth prospects for the market in the coming years.